Leaders – are they born or are they made? Are leaders born or are they made? 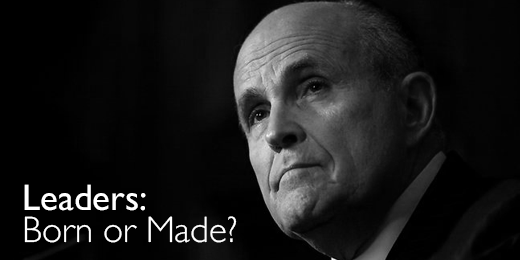 According to Sir Rudy Giuliani, former mayor of New York City, they are made (after they are born, of course). Rudy Giuliani addressed a group of business professionals today at ‘In The Room’, a leadership and performance management event in Sydney. Whilst I may have a bias towards Giuliani (I’m a Yank, living in Oz, who happened to be living in the third largest City in the USA on September 11th 2001), there is no doubt he displayed amazing leadership during and after 9/11. I, along with the rest of the world, watched a truly inspiring leader react calmly and with authority to an unprecedented disaster. Today, Giuliani shared his insights on the six traits successful leaders have in common, which he believes ALL of us are capable of possessing. 1. To be successful, Giuliani believes you must have strong ideas, goals, beliefs or vision. Without this, others can’t follow or support you. Know what you want to achieve, so that others can share your goals and help you achieve them. 2. It is also essential to be an optimist and a problem solver. He demonstrated how no one (except perhaps a crazy NY street person) follows a doomsdayer. By providing hope and showing there is always a solution, people will follow. 3. All great leaders display courage. They stare danger in the face, and move forward anyway. The first step is to understand that courage is not the absence of fear (everyone feels afraid sometimes), but rather courage is what you do with your fear. 4. Giuliani suggests leaders use fear in creative ways, such as Relentless Preparation or “practice makes perfect.” Through repetition, rehearsal, reviewing and questioning, preparation minimises the fear of failure, a fear that stops most of us from becoming effective leaders. Once you have rehearsed and rehearsed, questioned, reviewed and otherwise prepared, you can handle any situation that comes up. 5. To truly accomplish results, a leader requires a great team. Giuliani explains that leaders take a hard look at themselves and understand their weaknesses. They then go out and find someone (or a team) who is good at what they are not. Balance the strengths and weaknesses within yourself and your team, and you will succeed. 6. Good leaders are also good communicators. Clearly articulating what you want, and where you want to go leads to results. By measuring success (and failure) along the way you provide feedback to everyone involved. Constant clear communication is key. The wrap of this inspiring speech extended the list to include a seventh trait: love. You may wonder, “What does love have to do with Leadership in my organisation?” Well, according to Rudy Giuliani, we must care about one another and connect with each other to be a truly successful team. Being there when things go wrong, means you will all be together when things go right. Whilst some of these steps may be harder to master than others, all of them do seem like things each of us can strive to achieve. So which trait will you work on today? This blog post was originally posted on EvettField. This entry was posted in Business, Leadership, Strategy and tagged Goals, Leadership Sydney, Performance Management, Rudy Giuliani, September 11 by MFadmin. Bookmark the permalink.